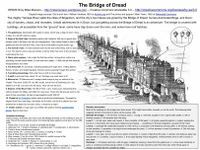 The mighty Temese River splits the cities of Brigadoon, and the city’s two halves are joined by the Bridge of Dread: human-dominated Briga, and Doon: city of sorcery, chaos, and monsters. Untold adventures lie in Doon, but just getting across the Bridge of Dread is an adventure. The bridge is covered with buildings, all accessible from the “ground” level, some have trap doors over the river, and some have roof hatches.